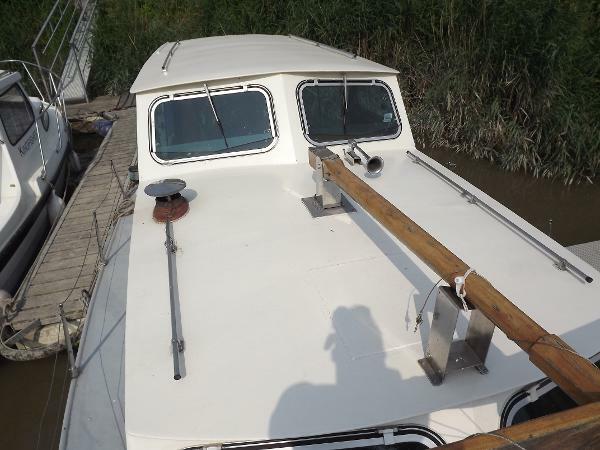 Specifications: Year: 1977 LOA: 9.50 m Beam: 3.15 m Draft: 0.50 m Construction: Steel Hull / Keel: Displacement HIN: N/A Description: A comfortable one or two person liveaboard with aft cabin. Engine(s) & Electrical: Ford 592, 3610cc, 4 cylinder diesel. Engine hours: 2315. Twin fuel tanks. Twin batteries charged from the engine. Shore power. Battery charger. Hydraulic wheel steering. Accommodation & Below Deck: 4 berths, 3 cabins, cloth upholstery, timber cabin sole, hanging locker, solid fuel stove, CD stereo, gas cooker with over, galley sink, coolbox, pumped cold water system, 280 litre water capacity (2 stainless steel tanks). 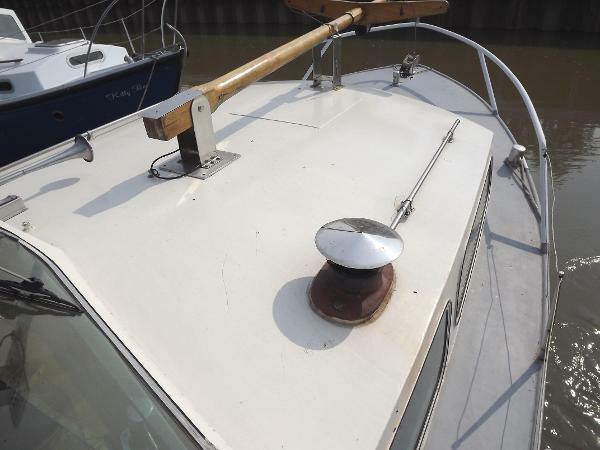 Deck & Canvas: Anchor, davits, stanchions, guardwires, warps, fenders, boathook, cockpit cover. Navigation & Safety: Navigation lights, fish finder, clock, barometer, fire extinguisher, first aid kit, lifebouy, gas detector, fire blanket, bilge pump. Miscellaneous: Last survey in 2016 (thinnest steel 4.8mm). Mooring in Sandwich paid until 28.02.19 and available seperately. Viewings are by appointment only. For an instant insurance quote call Euromarine Insurance Services on 01843 603345. Disclaimer: The particulars detailed herein are intended to give a fair description of the vessel, but their accuracy cannot be guaranteed. These particulars are supplied on the understanding that all negotiations shall be through Highway Marine Ltd who are acting as brokers for the vendor. The vendor is not selling in the course of a business unless otherwise stated. The prospective purchaser is strongly recommended to check the particulars, and where appropriate, at his own expense, to employ qualified independent agents to carry out a survey, and/or any mechanical and electrical checks. Specifications: Year: 1907 LOA: 19.9 m Beam: 4.3 m Draft: 1.0 m Construction: Cast Steel Hull / Keel: Displacement HIN: SSR 134573 Engine(s) & Electrical: Ford 2723, 109hp diesel. Serial no: 926F7EDA. Last serviced: March 2017. Engine hours: 348. Maximum speed: 15 knots. Drive type: diesel to velvet drive (2:9 trans). Fuel capacity: 800 litres. Fuel consumption: 3-4 litres per hour. 3 banks of 12V batteries charged from the engine via 60 amp alternator. 240v battery charger. 8kw Kaboda generator. Shore power. 2400 watt inverter with 30 amp charger and solar panel controller. Two - 250 w solar panels. Accommodation & Below Deck: 7 berths, 2 metre headroom, curtains, new upholstery, solid maple flooring, glass saloon table, chart table, hanging lockers, wet locker, 2 heads, 2 wash basin, 2 showers, stereo, heated by oil fired AGA stove, underfloor heating heated by AGA, AGA cooker, microwave, induction hob for hot days, gallery sink, refrigerator, separate freezer, dishwasher, washing machine, holding tank, crockery and cutlery, hot & cold pressurised water system, 1000 litres water capacity. Deck & Canvas: 2 anchors, windlass, substantial stanchions/guardwires, boarding ladder, 4 hatches, 10 opening ports, external table, warps/fenders, 3 boathooks, 2 rope lockers, fully enclosed pilot house, custom step for boarding when necessary. Navigation & Safety: GPS, portable echosounder/fishfinder, log/speed indicator on the VHF, VHF radio with AIS receiver, compass, navigation lights, helm indicator, 2 lifebouys, 6 lifejackets, flares, 2 search lights, fog horn, CO2 and fire/smoke detector, radar reflector, intruder alarm, fire extinguishers, fire blanket, 3 bilge pumps. Engine room automatic dry chemical fire control system. 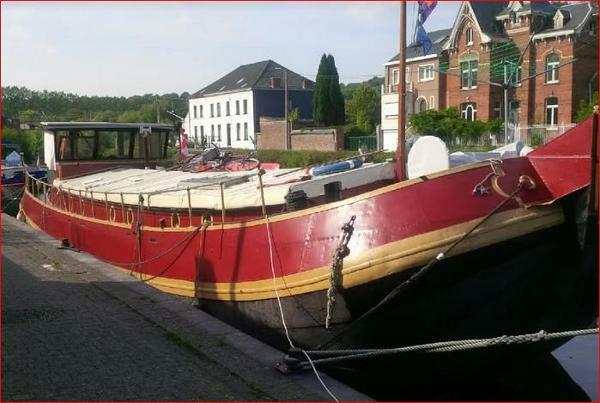 Miscellaneous: “She is a fully fitted, comfortably livable barge, finished tastefully and ready to cruise or live aboard. 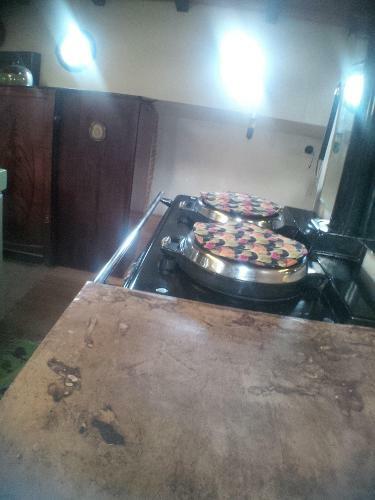 When the weather turns cool the diesel fitted AGA will keep the barge beautifully warm and dry. 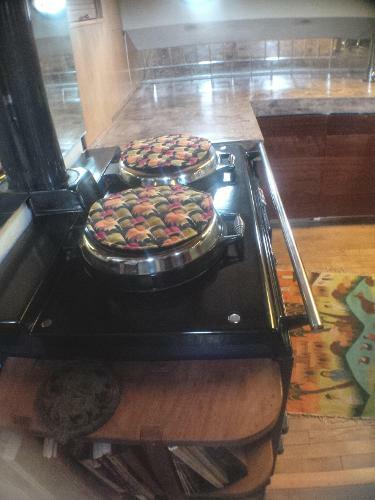 The AGA also supplies the under floor heating, cooks your meals and heats your water. When connected to the mains it is like living in a comfortable house with all the charm of marine living. Summer cruising is as easy as disconnecting the lines and heading out. 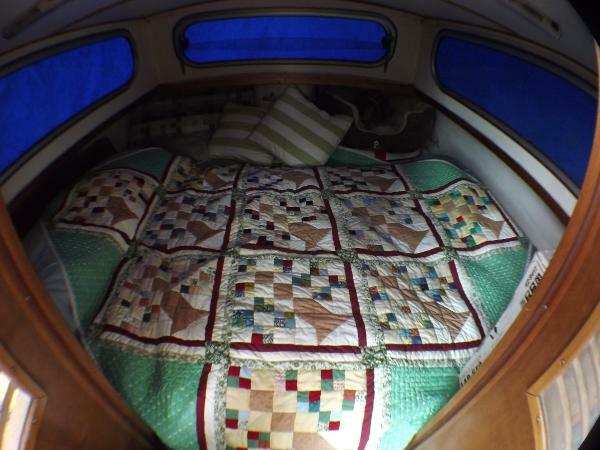 Sitting in the wheelhouse gives you a 360 degree view and a daybed for a nap. Guests have own stateroom with double bed, sink, toilet and shower. The gallery features unique concrete counters and island, making food preparation a pure pleasure, also equipped with fridge, freezer, chest freezer, dishwasher, washing machine. The salon has a sofa that opens to a double bed, an arm chair and 2 separate chairs, antique desk and a unique Cellarette for storage. Separating the salon from the master stateroom forward are 2 large wardrobes and lots of storage. A unique bespoke bathroom includes a composting toilet, shower, Victorian hip bath and copper Pullman sink. Further on is the master stateroom with California king size bed, storage underneath, wardrobe and full shelves for storage. Emergency escape door to the forward hatch is located on the forward bulkhead. Barge is insulated with 50mm kingspan in the roof and 35mm in the walls. Roof is new original style varnished hatch boards creating wonderful height and space. ‘Silk Purse’ was last dry docked in September 2017 for general cleaning and maintenance of the bottom. A full survey and thickness measurement taken in April 2015 is available to the buyer. Barge will be berthed at the Yacht club in Diksmuide Belgium from the 1st week in October 2017, the mooring has been paid until end of March 2018. Mooring in Sandwich, Kent available.” Viewings are by appointment only. Disclaimer: The particulars detailed herein are intended to give a fair description of the vessel, but their accuracy cannot be guaranteed. These particulars are supplied on the understanding that all negotiations shall be through Highway Marine Ltd who are acting as brokers for the vendor. The vendor is not selling in the course of a business unless otherwise stated. The prospective purchaser is strongly recommended to check the particulars, and where appropriate, at his own expense, to employ qualified independent agents to carry out a survey, and/or any mechanical and electrical checks.